I was amazed the other day when I realized I’ve deciphered five different terms for “father” of “dad” in Mandarin, just by watching the videos. This is either a sign of significant progress or a reflection of the importance of father figures in Chinese culture. Then again, it could be mere coincidence. Regardless, with so many gaping holes in my fledgling vocabulary, it is funny that I have picked up so many ways to say the same thing. The more formal term for father seems to be fuchin (1). But momo and Qiao Hu taught me that dad is most often rendered by children as ba or baba (2). 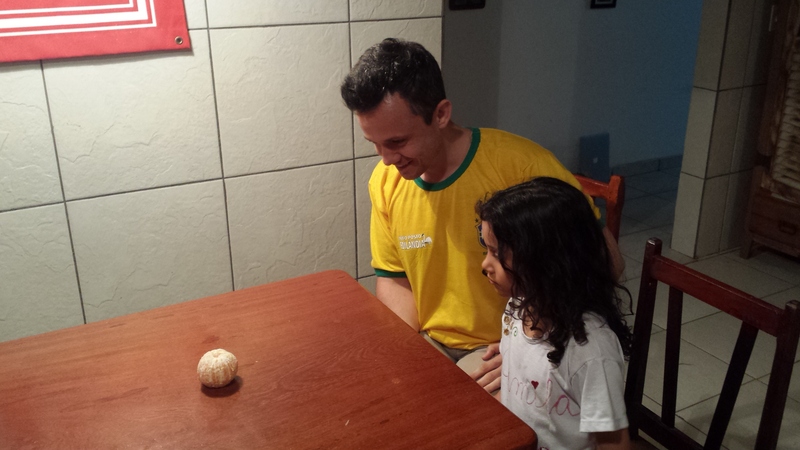 However, the fish Nemo calls his father lo ba (3). Yet the Disney character Mulan on occasion calls her father dee-é dee-é (4). Finally, if I’m not mistaken, in the movie Shower, a couple of times the sons call their father fa (5). Conversely, I initially learned in momo that the term “ma” means mom in Mandarin. However, I subsequently learned that ma can also mean horse. Finally, in House of Flying Daggers, ma apparently is used to mean blind. There are probably variations in tonality, but my ear is not fine tuned enough to pick up these differences yet. In other news, since I am on vacation and got a nasty little cold these days, I’ve been watching more Mandarin than ever. 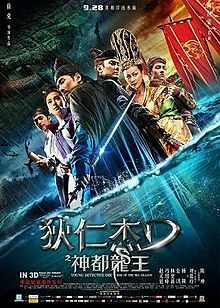 For better or worse, I’ve been spending hours on movies, both original Chinese movies and dubbed Disney movies, repeats and newbies. I’ve just updated my Films page and spreadsheet. I’ve watched several new movies in the past month and a half, namely Slam, Warlords, Young Detective Dee, Mulan, and Nemo. Slam is about Chinese teenagers who play basketball. It’s a typical family sports story, about a shy kid who is teased by bullies and has problems with his dad, but who loves basketball and uses it to help him overcome many of his issues. If you love these themes, you will probably enjoy the movie, and it provided my best insight to date on teenage Chinese culture (heavily influenced by the West). Otherwise, it’s a mediocre film that is not quite worth the time. 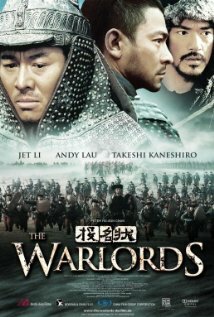 Warlords is much better and I definitely enjoyed it, although it’s not as good as some of the other epic war films I’ve seen. Young Detective Dee is also enjoyable, but not great. There’s fighting, mystery, investigation, humor, and mythology, but falls just a bit short on quality. 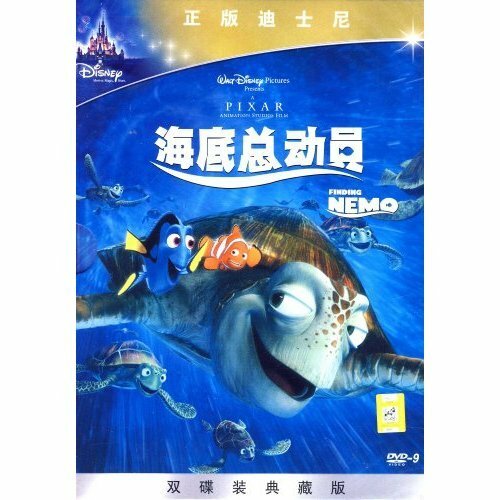 Mulan and Nemo are a big (albeit planned) new phase of viewing for me, since they are Disney movies dubbed in Mandarin, rather than original Chinese movies, which is all I had watched before. I highly enjoyed both of them and intend to watch them many times. I think that after watching them about 3 times, I will take the subtitles off and continue watching them with just audio to train my ear intensively. I’m hopeful that this will be a faster and more effective acquisition approach than any other, except perhaps watching Qiao Hu. The reasons I expect to be able to do this successfully with these high quality Disney movies are threefold. First, they are immensely entertaining and easy to watch. Unfortunately, my enjoyment of movies generally drops precipitously when I watch them repeatedly, so I’m not sure I’ll even be able to do it easily with a movie I love like Nemo. However, it’s the best chance I have. Second, since these are kids’ movies, the dialogue is relatively easy to follow. Even for a true beginner like me, I think I will be able to understand up to 50% of the dialogue after becoming intensely familiar with the movies by watching them repeatedly. Third, these are movies I can watch with my daughter, which is a huge advantage for a parent. 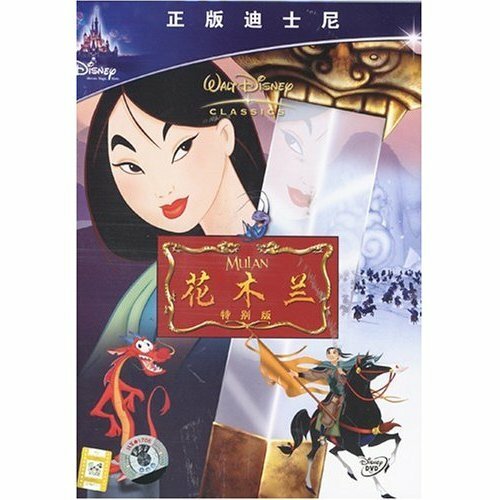 Speaking of which, as expected (and mentioned in my previous post), at least for the first week, these Disney movies have been the solution to get her watching Mandarin again. 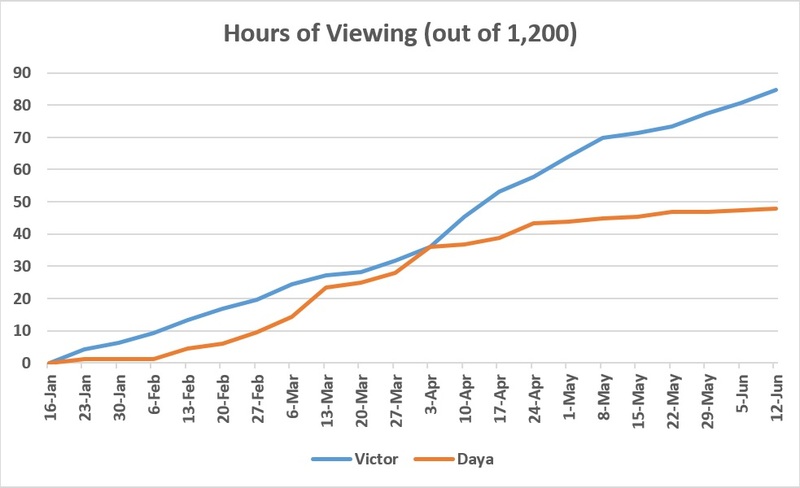 Check out the updated Hours of Viewing graph. I also updated my Estimated Comprehension vs. Time graph. I tested my comprehension using a soap opera, as before. I still understand no sentences, but only isolated words. It’s very hard to estimate how much I am understanding, since I often think I recognize a word but don’t know if it actually means what I think (or if it just sounds similar but means something completely different). However, I think I am understanding at least 1 out of every 40 words, or 2.5%. Due to personal issues, in the past two weeks I haven’t watched Chinese on most days. From May 22 to June 1, I watched Mandarin videos on only 4 out of 11 days. However, I watched 3 movies (2 on one night), so my average time did not go down too much. I’m still at an average of close to 35 minutes per day at the 136th days of my experiment. Still, I’m slightly frustrated because I think the best strategy (within the parameters of my experiment) would be to watch some Mandarin every single day, and Qiao Hu on most days. I’ve actually done the opposite recently—watched subtitled movies sporadically—and I don’t feel like I’ve progressed much. Here’s a picture of me watching Qiao Hu with Camila Daya using me as a sofa so that she could watch, too. She likes to watch videos in the oddest positions, and she really got a kick out of using me as a piece of furniture. I’ll often catch her upside down, with her head on the sofa seat and her legs up in the air, while watching TV. It’s hilarious. As I’ve commented before, a huge upside to watching movies is that I feel like I’m becoming more and more familiar with Chinese culture. Of course I’m just barely scratching the surface, but I thought about writing about my insights thus far in this post. My general idea was to single out certain characteristics of Chinese culture that are either similar or different from Western culture. However, even if I were explicit about these “findings” being preliminary, I think this would be hugely premature. I just don’t have much to say as yet. I’m very hesitant about coming to sweeping conclusions even about the culture of countries I’ve lived in for a decade or more (Brazil and the United States), so commenting on even preliminary findings about the culture of a country I’ve never even visited or studied, but only caught glimpses of by watching a handful of subtitled movies, would probably be downright silly. Instead, I’d like to ask my readers to begin the discussion. For those of you who have lived in China or otherwise had contact with the culture, what are your impressions? Are the Chinese essentially different from or the same as Europeans, Americans, Latin Americans, other nationalities, etc.? In what ways? I will give you my own impressions, however superficial and limited they might be, when I get farther along in my experiment.